← Holy Week Questions: Where Do We Need to Catch Up? News Anchor: Thank you Roger. This news gives everybody hope. Me: (in my head) Does it? And why do you need to comment? There are journalists who research and report the news. And then there are talking heads who opine about the news and deliver their take as if they are journalists. Note: Hannity, Maddow, etc. are not reporters or journalists. They offer commentary that supports what they consider to be true/right/real. This has divided us. Millions of people watch what appears to be The News when what they are actually watching hours of opinion pieces that perpetuate their own political stances. What is the plain meaning of a news story? It’s about facts and only facts. Fact: The Cathedral at Notre Dame burned. Commentary: Even the faithless are in mourning. Fact: Meghan Markle is going to have a baby. Commentary: British tabloids are reportedly upset that there will be no newborn photo shoot. What was said before and after the specific sentence that troubles you? Abraham reached out his hand and took the knife to kill his son. Two she-bears came out of the woods and mauled forty-two of the boys. Abraham is a child murderer. Mother Bears were a special danger in ancient Israel. The top lines come from the Hebrew and Greek Scriptures. The bottom set seems to point out “the plain meaning” of those top lines. But to understand what’s going on, a preacher will offer the historical context, the probable audience, the genre (is this from a poem? ), and the textual features. A solid preacher will explain that Genesis 2 is about the end of child sacrifice, 2 Kings 2 is about the importance of respecting God’s prophets, and John 11 is about the death of Jesus’ friend Lazarus and – being a human being – Jesus wept when Lazarus died. Spoiler alert: Easter is not the first resurrection story in the Greek Testament. My point is this: some commentary is good. We need to know the context, the history, the audience. 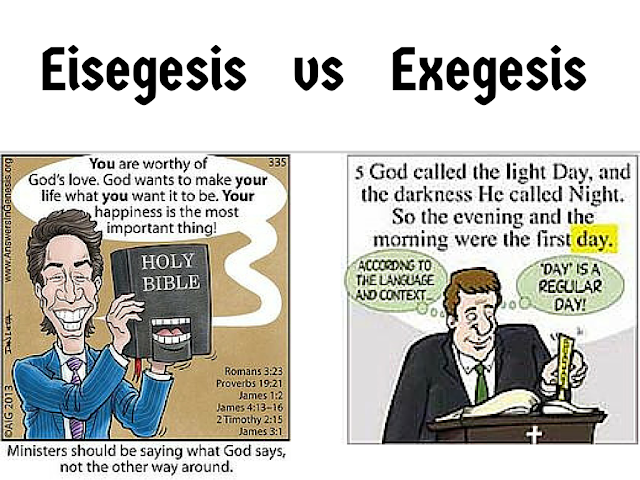 But we don’t need eisegesis either from preachers who are twisting scripture to make it say what they want it to say or from media personalities who are twisting words to create drama. Fake news is real. Fake theology is real. God gave us brains to discern what is real and what is not real and in this Holy Week, we remember Jesus whose words were twisted and whose actions were misconstrued. Looking back on that day 2000 years later, we can see that Jesus was executed unfairly. But in the First Century, perhaps we would have believed the commentators too. Perhaps we would have listened to the politicians who gaslighted him. Here in the middle of Holy Week, I pray we will not be lazy followers of Jesus. I pray we will not be lazy citizens. I pray we will defend people who are being gaslighted like Representative Oman. We can agree with her or we can disagree with her. But if we allow people to crucify her, we are no better than they are. Image from The Berean Corner. I fail to see how the actual quote (which I have heard many times) clarifies anything. She is factually wrong about CAIR being formed as a result of 9/11. (It was formed in 1994. Google it.) Even in full context, how is the statement “some people did something” not a minimizing of what happened? She couldn’t even have said “some people did something horrible?” I remember listening to a talk radio show shortly after 9/11 and a Muslim called the show in tears, saying how ashamed he was of what the terrorists did and how badly this would damage the reputation of the faith of Islam. That caller moved me almost to tears and reminded me of why I hate group think, from either side. Thank you for this comment, Keith. I agree that her fact about CAIR’s creation timeline was incorrect and I so wished she had inserted the word “terrible” or “horrific.” Those were mistakes. But I still believe we are called to treat her as Christ would.